COMMENTARY ON "THE PERSON OF PETER"
So yes indeed, why did Peter doubt? Or rather, why did he no longer have any doubts after the resurrection? First we will follow along with each of the daily lessons and then on Friday's commentary address this question, founded upon what Scripture teaches. Day Two, Sunday, March 26: Depart From Me! The title for today's lesson comes from Luke 5:8, the account of Jesus' miracle of the overflowing net full of fish, upon which Peter falls in front of Jesus knees and said; “Depart from me, for I am a sinful man, O Lord”. In John's account Andrew finds his brother Simon and tells him that Jesus is the long promised Messiah. We also learn two things about certain names. 'Christ' means 'Messiah' and 'Cephas' means 'Peter' or 'Rock' as recorded in Matt.16:18 in the words of Jesus. In the Luke account, the miracle of the overflowing catch of fish, we see that Simon Peter not only knows that Jesus is the Christ (the Messiah) but that he is someone who is holy, in-other-words he realized Jesus is the Son of God. Peter, who knew himself to be "a sinful man" trembled in feared at being in the same boat with Jesus. As Jesus later says in Matt. 16:13-19, only the 'Father who is in heaven' could have reveled to Peter that he is the 'Son of the living God'. As the rest of this week's lesson illustrate from the biblical record, Simon Peter was anything but a Rock in his many shortcomings and failures prior to the resurrection of Jesus Christ. Since he already knew that Jesus Christ is the Son of the living God just what was about the resurrection that would forever change Simon Peter into the person he became? From John 1:40-42 where Andrew told his brother Simon “We have found the Messiah” we are informed that the name 'Christ' means 'Messiah' and that this knowledge was an understanding that must have been shared by all of Jesus' chosen disciples from the very beginning. Of course two chapters back in Matt. 14 verses 22 & 33 the disciples worship Jesus as the Son of God. Jesus' responded to what Peter said (Matt. 16:23) by saying “Get behind me, Satan! you are a hindrance to me. For you are not setting your mind on the things of God, but on the things of man”. This was a direct command that Satan had no choice but obey. The lesson author is wrong. This meeting and the question asked by Jesus is not when the disciples first knew Jesus was the Messiah. The real reason for Jesus to ask them "who do you say I am" was for them to learn that he the Messiah must very soon die in Jerusalem at the hands of the Jewish authorities instead of freeing them from Roman rule. Peter's response to Jesus' announcement exposed his blindness to the understanding that all prophecies in Scripture, including Gen. 3:14-15, must be fulfilled and that his coming death at Calvary was to make full completed atonement for the sins of fallen mankind. When Jesus did rise from the grave just as promised, God reveals himself as faithful to fulfill all that he said he would do in the exact perfect way he said he would. Today we are examining the time when Peter walks on water as recorded in Matt. 14:22-33. The lesson comments are in error in that they focus on Peter instead of Jesus. When Jesus said to Peter; "Come" (in the account of Peter's walking on water) the ability for him to do so was within Jesus' infinite power. Even in Peter's limited faith Jesus saved Peter from drowning. Even though Peter wavered Jesus had no intention of allowing him to drown. Peter's growing but limited faith was to learn that what Jesus said him to do was an invitation to totally and solely place his faith upon Jesus Christ the Son of God. Just like Peter, when our faith includes our own fleshly limited strength to perform we will be less than perfect and fail. The lesson topic is on when Peter denied knowing Jesus "three times before the rooster crowed on this very day". The quarterly lesson errors by focusing on Peter's failure without stressing that all the other remaining disciples had also abandoned Jesus. They would later learn that in their abandonment of him Jesus would never do the same to them. Ironically Judas did the reverse by betraying Jesus with a kiss. What we should do is remember how Jesus forgave Judas. Scripture does not say Jesus was disappointed with Peter's actions. The one thing Jesus did do was to pray that Peter's faith would not fail while at the very same time knowing Peter would deny him three times. Since in the infinite power of Jesus as the Son of God he wouldn't pray for something that would not also occur we must believe Peter's faith never failed even in his denial of Jesus. Perhaps this is somewhat akin to the example of Abraham's faith when he laughed at God (Gen. 17:1-21) at the announcement that he would have a son through Sarah in her old age. Keep in mind that God gave Abraham the sign of circumcision because God knew that even as he laughed, Abraham's faith in the promises God would not waver. Abraham received both the promises of God and the sign of circumcision long before he had yet done anything to reveal his absolute faith in God. A few short hours before Peter's actual denial Jesus assured Peter that he would "have turned again" and would then be able to 'strengthen his brothers'. While Peter would spend three days in remorse over his denial of Jesus, Jesus' comforting words which culminated with his resurrection would dynamically transform Peter as was displayed on the day of Pentecost. "According to Ellen G. White, Peter’s compromise and failure began in Gethsemane when, instead of praying, he slept, and thus wasn’t spiritually ready for what was coming. Had he been faithful in prayer, she wrote, “he would not have denied his Lord.”—The Desire of Ages, p. 714." Since Jesus had already told Peter he was under a direct attack by Satan and that Peter would deny him as a result of this how dare Ellen G. White suggest and attach importance to something Scripture does not say was what led to his denial. Condemning him as she does is precisely what our loving Savior Jesus Christ does not do to Peter. Later on, in John 21:15-19, instead of rebuking Peter for his past failures, Jesus quietly asked Peter if he loves him three times. 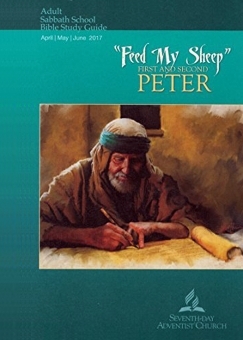 After Peter's repeated response that he does loved him, Jesus' instruction to Peter is to "Feed my sheep." and "Follow me." "During the ministry of Jesus, Peter often acted in the role of leader of the 12 disciples. He was their usual spokesman. When Matthew lists the disciples, he says “first, . . . Peter” (Matt. 10:2). Peter also took a prominent role in the early church." Peter didn't assume leadership on his own authority. Jesus Christ publically appointed Peter as his personal spokesman (ambassador) with full authority to lead and make decisions affecting the church, the true universal body of Christ here on earth. As is true with any ambassador his one main duty was to communicate the will of Jesus Christ that would apply to the church in all ages. Jesus' one important command just before his ascension was the instruction to wait for the coming of the Holy Spirit which occurred on the day of Pentecost. Before that day however, the one astounding event that changed the life of Peter forever was the resurrection of Jesus Christ exactly as was promised by Jesus. The events of Calvary culminating in the resurrection fulfilled all the prophecies leading up to Calvary and revealed to Peter that everything Jesus Christ ever said to him was totally and eternally true. It humbled him that the Savior's love for him was eternally secure in spite of his own failure and sin contaminated flesh. Today's lesson quotes Ellen G. White where she says Peter was "Converted". Yet, as you study her words you will see that she fails to give a biblical understand of what it means to be converted by focusing on the actions of Peter instead of the works of Jesus Christ. The biblical definition of 'converted' is to be found in John 3:1-15 where Jesus declares that our human dead spirit must be "born again" of the Holy Spirit before you can be brought into the kingdom of God and have eternal life. Jesus Christ, through his atoning death at Calvary for the sins of the world is the one who will bring a sinner into the kingdom of God through his gift of the indwelling Holy Spirit. None of this is of the will or actions of self. The sins of a sinner can only be covered by the sinless holy shed blood of Jesus Christ the Messiah. It is for good reason that the Christian faith is founded upon and compared to that of Abraham's. As was mentioned earlier this week, God gave Abram (Abraham) the sign of circumcision in the covenant he made with Abraham without Abraham ever becoming a perfect man and long before the time he obeyed God in his willingness to sacrifice Isaac. God reckoned Abraham as perfect and in the kingdom of God only upon the yet to be shed blood of the promised Messiah, Jesus Christ. As it was when Abraham laughed at God, the same is true of Peter's faith and salvation. At the Lord's Supper Jesus Christ reckoned Peter as eternally secure in the kingdom of God yet all the while knowing Peter would soon deny knowing him. Following upon Jesus' resurrection, humbly realizing that this was all and only through the faithful work and love of Messiah Jesus Christ, Simon Peter's life is transformed. This is the reason Peter became such a dynamic Ambassador for Christ. Peter could now humbly wear the name of Cephas, Peter the Rock, Jesus gave him upon their very first meeting. Peter became the ambassador of our true Rock Jesus Christ, the author and finisher of our faith. Copyright 2017 BibleStudiesForAdventists.com. All rights reserved. Revised March 28, 2017. This website is published by Life Assurance Ministries, Camp Verde, Arizona, USA, the publisher of Proclamation! Magazine. Contact email: BibleStudiesForAdventists@gmail.com.